Floods shaped much of the modern Columbia River’s course. Regular annual cycles of flooding in spring and early summer influenced the anadromous life history of Columbia basin salmon and steelhead. Floods scoured away the topsoil and loser layers of rock, created the channel of the modern river and exposed the solid basalt that is the foundation for many Columbia River dams. The multiple floods that carved the river’s course between modern-day eastern Washington and the Pacific Ocean occurred between 12,800 and 15,000 years ago, at the end of the last ice age. The Cordilleran ice sheet covered the Pacific Northwest at the time, extending as far south as the Puget Sound area, the southern reaches of the Okanagon River and the Columbia River valley in north central Washington, northern Idaho and northwestern Montana. There, in northwestern Montana, an impoundment known as glacial Lake Missoula repeatedly undermined the 2,500-foot-tall ice dam that held it back. The ice dam was on the Clark Fork River east of Lake Pend Oreille and near present-day Missoula. The resulting floods — there were more than 100 — coursed through northern Idaho, eastern Washington and the Columbia River Gorge, carving the Grand Coulee and the Big Bend and scouring the Columbia River Gorge to its underlying basalt. Today these are known collectively as the Bretz Floods, for J. Harlan Bretz, the geologist who first described them in 1919. Water in the Gorge reached 700 to 900 feet deep. Water in modern-day Portland, Oregon, more than 500 miles downstream, was 400 feet deep. Mineral deposits were carried from western Montana to the lower Columbia River. According to geologist and author John Elliot Allen, these were the greatest scientifically documented floods known to have occurred in North America, inundating nearly 16,000 square miles in places up to several hundred feet deep. Allen estimates that during the floods the Columbia carried ten times the flow of all the rivers in the world today and 60 times the flow of the modern Amazon River. The floods scoured more than 50 cubic miles of silt and sediment from the Columbia Plateau, leaving the network of scabland channels and bare basalt surfaces that are evident today. Flood waters extended to the southern extreme of the Willamette Valley at Eugene. Floods, among the many catastrophic events that shaped the modern Northwest, helped shape the unique life history of salmon, as well. Over time, salmon adapted to changes in climate and the physical environment. During the last ice age, Pacific Northwest salmon probably populated rivers as far south as California. Repeated floods altered their habitat, and the warmer climate that followed the retreat of the ice probably caused salmon to abandoned the warmer, more southern rivers and move north again. As the modern Columbia River Basin took shape, salmon adapted their journey to the ocean to coincide with the annual snowmelt freshet in the spring and early summer. The rushing water provided the fastest possible journey from the freshwater spawning habitat to the estuary, where the fish undergo physiological changes to adapt to salt water before spending most of their adult lives in the ocean. The Columbia River annually pours an average of 180-190 million acre-feet of water into the Pacific Ocean, the fourth-highest volume of all rivers in North America. With the bulk of the runoff coming in the spring and early summer when snow melts in the many mountain ranges of the Columbia River Basin, the river quickly can become a raging torrent, rise by a matter of feet overnight and stay bank-full or beyond for days. Winter floods can occur, as well, when warm, wet weather systems move in from the Pacific and override or clear out the colder air of the interior basin, and rain falls on snow. Despite its huge annual runoff, the Columbia does not have a history of catastrophic flooding like the Missouri or Mississippi. There were major floods in 1876, 1894, 1948 and 1964, but before the construction of dams in most years the Columbia simply rose in the spring and early summer, flooded low-lying areas that were not protected by dikes, and then receded. Usually this was more of an inconvenience than a disaster. In April 1936, for example, as construction got underway at Grand Coulee Dam, wooden frames around the excavation pits could not hold back the river, which rose 10 feet by April 21. Water poured into the excavations on the east side of the dam, delaying the work. The exceptions, however, are notable and important. The flood of 1894 crested in the Columbia on June 6 and 7, when the flow at The Dalles, Oregon, 191 miles inland from the ocean, peaked at 1,240,000 cubic feet per second on June 6. The annual average flow at The Dalles, where river data has been collected since 1879, is 191,400 cubic feet per second. Some older buildings in downtown Portland have painted lines as much as five feet above the sidewalks to show the level of the Willamette River in the flood of 1894, and those buildings are — and were — hundreds of feet from the shore. At Vancouver, where the river level was monitored but not the flow velocity, the Columbia reached its all-time record high on June 7, 1894, 34.4 feet above sea level. The normal river level at the Vancouver gauge, which is located at river mile 106.5, five miles upstream from the confluence of the Columbia and Willamette, is 1.2 feet above sea level. Nonetheless, major flooding was rare. It was the tremendous volume of annual runoff that attracted federal river planners, not the need for flood control. The river had great potential for hydropower if only the vast volume of water could be contained behind dams — which also would provide flood control. The first thorough analysis of the power potential came in response to the 1925 Rivers and Harbors Act, in which Congress directed the U.S. Army Corps of Engineers and the Federal Power Commission to determine how much it would cost to conduct a survey of the nation’s rivers and recommend ways to improve them. The following year, 1926, the agencies reported their cost estimates in House Document 308, and in the 1927 Rivers and Harbors Act Congress ordered the surveys. These river reports, and others like them that followed over the years, have been called “308 Reports” ever since. The Corps’ 308 Report of 1932 declared that Columbia floods could be handled by the construction of dikes at communities where damages might occur. The report focused on building dams to provide navigation on the lower Columbia and virtually ignored discussion of upriver water storage projects. Three years later in the 1935 Rivers and Harbors Act, Congress authorized construction of Bonneville and Grand Coulee dams. In fact, the dams already were under construction as New Deal-authorized projects. Grand Coulee would provide water storage, hydropower and flood control; Bonneville would provide hydropower and navigation. In 1937 the Corps’ Ben Torpen issued a report entitled “Where Rolls the Columbia,” which recommended construction of storage dams that would enable greater hydropower development than would be justified based on the Columbia’s erratic annual flows. At the time, the ratio of the Columbia’s highest annual flow — 1.24 million cubic feet per second at The Dalles during the flood of 1894 — to the river’s lowest recorded flow — 36,000 cubic feet per second at the same location in 1937 — was 34 to 1. Torpen proposed the development of 125 million acre-feet of storage but said only about 67 million acre-feet was feasible. Coincidentally, that is about how much storage ultimately was developed. Like others who had studied the Columbia before him, Torpen’s proposals did not excite much interest; his superiors at the Corps remained focused on navigation. In 1943, there was renewed interest in Columbia Basin water storage for hydropower purposes when the War Production Board asked the Corps and the Bonneville Power Administration how electricity production might be increased quickly for the war effort. This led to Congressional authorization of Hungry Horse Dam on the South Fork Flathead River in Montana in 1944, a dam that would provide hydropower, water storage for downstream power generation and flood control. After some delays the dam was completed in 1952. Additional upstream storage for flood control, however, remained a low priority. That changed in 1948. That year a monster spring flood not only was a disaster in terms of property damage and lost lives, but it also prompted attention in Congress and led to the construction of new dams. In late May and early June of that year, the river went on a rampage. The flood of 1948 was basinwide, affecting communities as far upriver as from British Columbia. At Grand Coulee Dam, 595 miles inland on the Columbia from the ocean, the river flow peaked on June 12 at 633,000 cubic feet per second, more than three times average. At the Vancouver river gauge, the Columbia crested on June 13-14 at 31 feet above sea level. The flood lasted 20 days. 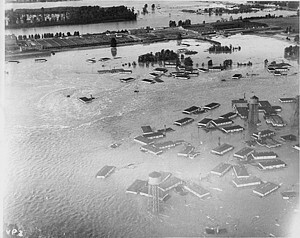 The worst damage occurred in Vanport, Oregon, where the flood waters broke through a railroad dike on May 29. Vanport, on the south shore of the river across from Vancouver, Washington, was a community built quickly during World War II to provide housing for workers at the Kaiser shipyards in Vancouver and Portland. Thirty-two people died and seven were reported missing and presumed dead. The community of 18,000 was destroyed. The Corps quickly revised an update of the 308 Report, called HD531, that had been underway for several years and issued it in October. The report contained proposals for many new upstream dams, including some, like John Day Dam, that would provide both hydropower and flood control. The new projects would reduce the Columbia’s erratic flow ratio to a manageable 4 to 1 or 5 to 1 and make large hydropower dams more feasible. The 1948 report described 20 million acre-feet of potential water storage in the United States and Canadian portions of the Columbia Basin. This water could be used to generate electricity, and it also would help control floods, according to the report. At the same time, and in conjunction with the HD531 Report, the International Joint Commission issued a report that showed Canada was willing to build storage dams in that part of the Columbia River Basin in return for electricity or cash. It would take more than 20 years for the two countries to agree on the details, but this initial interest in flood control would lead to the Columbia River Treaty and the construction of Mica, Keenleyside and Duncan dams in Canada and Libby Dam in the United States for the purpose of controlling floods and maximizing downstream power generation. Today, flood control storage totals 37 million acre-feet (45.7 billion cubic meters). This is only flood-control storage. The total of all active storage in all Columbia River Basin reservoirs is 55.8 million acre-feet. The flood-control storage includes 16.5 million acre-feet (20.4 billion cubic meters) in the United States at the Grand Coulee, Albeni Falls (Lake Pend Oreille), Libby, Hungry Horse and Dworshak dams, and 20.5 million acre-feet (25.3 billion cubic meters) at the Columbia River Treaty dams in British Columbia. Flood control also provided by major levee systems, which have been constructed along the lower Kootenai River in the United States and Canada, the upper Flathead River below Hungry Horse Dam, the Pend Oreille River below Albeni Falls Dam, the lower Clearwater and Snake rivers near Lewiston, Idaho, and Clarkston, Washington, the Columbia River in the Tri-Cities area, and at more than 20 locations in the lower Willamette and Columbia Rivers from the Portland area to the ocean. 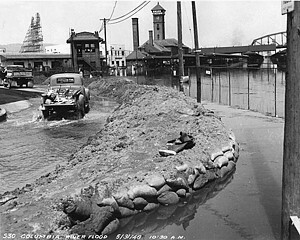 During the Vanport flood, the Willamette River was backed up from the Columbia and flooded into downtown Portland, here near Union Station. Same flood, near Vanport, Oregon. Photos: CCRH (inactive site).